SUNRISE — As accurate and deadly as the Florida Panthers were on the power play Tuesday night, it was what they did right after killing a penalty that was the difference in beating the Pittsburgh Penguins. Tomas Fleischmann atoned for a tripping penalty on Sidney Crosby by scoring the game-winning goal right after exiting the penalty box, and Tomas Kopecky recorded his first career hat trick as the Panthers beat the Penguins 6-4 in front of 17,378 fans at the BB&T Center. With the game tied at 4-4, Fleischmann tripped Crosby just 1:19 into the third period. The Panthers killed the penalty, with Jerred Smithson grabbing the puck as it ended. Smithson fed a pass to Fleischmann, who skated in 2-on-1 against Matt Niskanen, the only Pittsburgh defender back and forced to choose between Fleischmann or rookie center Drew Shore. Niskanen turned his back on the puck and picked up Shore, and Fleischmann zipped a wrist shot on Fleury’s stick side that pinged in off the post for the go-ahead goal with 16:31 remaining in regulation–his fifth goal this season and 100th of his career. Kopecky’s rebound and putback off a Brian Campbell shot was the only goal in the first period, but Pittsburgh’s James Neal scored his 13th on a weak wrister from the right boards that beat Florida goalie Jose Theodore in the first minute of the second. Kopecky’s second goal, another putback that he swept in while camped in front of Penguins goalie Tomas Vokoun, sparked a melee that ended with the two close friends fighting. Craig Adams cross-checked Kopecky to the ice after the goal, and Vokoun, who played four seasons with the South Florida club, punched Kopecky while the forward was sprawled in front of the crease. Kopecky got to his feet and took his own shots at Vokoun, while everyone on the ice grabbed someone in an opposing jersey. Mysteriously, the cross-check on Adams wasn’t called, and Florida found itself on the penalty kill as Kopecky received two minors for roughing. Kopecky, chosen as the No. 1 star of the night by NHL Network, said his former teammate in Detroit, Tomas Holmstrom, was a great mentor to learn from when it came to screening goalies and cleaning up rebounds. “I probably learned from one of the best in the League. It’s a fun part. Sometimes you get under other guys’ skin. Somebody’s got to do it and I love it. I’ve got no problem with it,” Kopecky said . Campbell and Marcel Goc added power-play goals 31 seconds apart, with Kopecky getting an assist after nifty stickhandling and a backhanded pass to Goc on his first goal of the year, which ran Vokoun from the game and brought in No. 1 goalie Marc-Andre Fleury. Pittsburgh, however, tied it on markers by Dustin Jeffrey, Paul Martin and Chris Kunitz, knotting the game at 4-4 as the horn sounded to end the second period. Scott Clemmensen relieved starting goalie Jose Theodore, who gave up four goals in 19 shots. Clemmensen, who beat Philadelphia last week in his previous start, responded by stopping all of Pittsburgh’s 15 shots in the third period, including three point-blank blasts while the Penguins were on the power player during Fleischmann’s penalty. His last big save was with 1:07 remaining when he blocked Matt Cooke’s slap shot from the top of the left circle. Erik Gudbranson and Goc worked the puck out to Kopecky for assists on his third goal. Kopecky posted the hat trick when he banked in a long clearing shot from inside his own blue line after Fleury had left the ice for an extra skater. Kopecky’s eight goals tie him for the team lead with rookie Jonathan Huberdeau and give him six goals and an assist in his last seven games. Kopecky, 31, had scored two goals in a game five times before but never netted a hattie. His four-point night paced the way, and Campbell and Fleischmann both had three points. Florida’s power play had been in a major drought, going 0-for-17 during its five-game winless streak before the Penguins (13-7-0) came in. The power play was also just a paltry 1-of-24 after starting off the season hot. However, the Panthers, who host Buffalo on Thursday, capitalized on 4-of-7 man advantages. After two long days in Daytona covering Speedweeks and eventually DanicaFest (i.e.–the Daytona 500), it’s time to get back to Florida Panthers hockey. I recorded Sunday’s matinee against the Bruins, avoided finding out the score and eagerly awaited watching it when I returned home. That didn’t turn out too well. What I saw late Sunday night was more of the same. The Cats (5-9-4) have been exposed as a team that isn’t as good defensively as last year, has much shakier goaltending than that Southeast Division-winning club, loses far too many battles for the puck and commits crucial mistakes by turning over the puck. But the big problem is the finish — or lack of it. Like last season, the Panthers can’t hit the net at key times and gain the momentum that puts teams away. Other clubs, especially those that win night in and night out and head to the playoffs, take advantage and bury those chances. Only one defenseman has an even-strength goal, Mike Weaver in Pittsburgh. No knock on Weaver because it’s not part of his game, but he shouldn’t lead Florida in any offensive category. Other than Jonathan Huberdeau (eight goals), Peter Mueller (six) and Tomas Kopecky (five), the forwards aren’t putting pucks away either. Tomas Fleischmann shouldn’t have the same amount of markers as Brian Campbell (four), and Campbell’s numbers, while impressive, shouldn’t exceed Drew Shore or Shawn Matthias. Or Stephen Weiss, which is another sore subject. The No. 1 center was benched in the third period against Boston, officially entering coach Kevin Dineen’s doghouse, and the whole top line — so good last season and a primary reason for the playoff appearance — has been a wreck. Weiss (one goal, minus-11) has been very unproductive, Fleischmann isn’t connecting on shots, and Kris Versteeg has one goal in seven games and was hurt after being hit by Alex Ovechkin. And it doesn’t get any easier. The Pittsburgh Penguins, the top team in the Atlantic Division, waddle in to South Florida Tuesday, and it will take a stellar effort and finish that has been nowhere to be found of late. Florida’s five wins are the fewest in the Eastern Conference and tied with Columbus for the fewest in the NHL. NO GENO: The Penguins’ star center Evgeni Malkin has a concussion and was put on injured reserve. The Russian forward, who will miss the next three games, had 21 points (4-17-21) in 18 games before being knocked into the boards by Florida’s Erik Gudbranson on a perfectly clean, hard hit last Friday in Pittsburgh. SHARP PENS: Sidney Crosby has paced Pittsburgh of late. He has three goals in five assists in his last five games, and he scored a pair in Sunday’s 5-3 win over Tampa Bay. Crosby leads the Penguins in points with 28 (9-19-28), while James Neal tops the club with 12 goals. Second leading scorer Chris Kunitz has seven goals and 14 assists. Pascal Dupuis also has seven tallies. POWER (PLAY) OUTAGE: Florida’s power play, which was so good to start the season, has been anemic of late. Well, anemic is being kind. Generally at this point, a Florida power play is simply two minutes in which neither team will score. It’s like taking a 2-minute slice of time out of the game. The Panthers have scored one man-advantage goal in its last 24 opportunities in the last eight games. In its 5-game winless streak, the Panthers are 0-for-17 on the power play. LOOSE PUCKS: Florida sent goaltender Jacob Markstrom back to San Antonio on Monday. The Swedish netminder was 0-2 with a 3.05 GAA and .915 SV% against two of the top Eastern Conference teams, Pittsburgh and Boston…Florida is facing Pittsburgh for the 75th time, holding a 31-30-4-9 overall record…Jonathan Huberdeau is the only rookie to lead his team in goals and is first among rookies in goals and second in points…Fellow rookie Drew Shore has six points (1-5-6) in his last seven games…Tomas Kopecky has three goals in his last five games and is third on the team with 44 shots…Colby Robak posted 14:53 TOI and two shots in his season debut Sunday filling in for Filip Kuba (upper body). A great moment against the Penguins at home a few years ago. Look out, Geno! Tues., Feb. 26, 7:30 p.m.
BB&T Center — Sunrise, Fla.
Florida has 14 points in 18 games: 37.3 over 48 games. Fox Sports Florida, 7:30 p.m.
Just when you thought you had these Florida Panthers figured out, the club turns around and plays an outstanding game like it did on Thursday night. The Panthers, fresh off being shut out to cap off a dismal four-game homestand, received 32 saves from Scott Clemmensen, and Jonathan Huberdeau and Peter Mueller each scored two goals, breaking a five-game winless streak and beating down the Philadelphia Flyers 5-2 at the Wells Fargo Center. Huberdeau, 19, put the Panthers (5-7-4) up early when his centering pass found Peter Mueller skating through the slot. Mueller’s snap shot pass Ilya Bryzgalov put Florida up 1-0, but it didn’t stay that way long. Just 29 seconds later, Mike Weaver sent a long pass to Tomas Kopecky, who fired another shot past Bryzgalov. The goal was Kopecky’s fourth of the season. Then Huberdeau, the No. 3 overall pick in the 2011 NHL Draft in Minnesota, showed off his creative ability after he was wrapped up by Kimmo Timonen on a breakaway against Bryzgalov. The Quebec native was awarded a penalty shot, giving Florida a chance to extend its lead. Huberdeau skated in and half-turned against the Russian goalie, faked on his forehand, opened the goaltender and slid the puck between his legs off the backhand. Bryzgalov then tossed his stick against the glass in frustration. While the penalty shot may have been a major body blow to Bryzgalov’s night, Huberdeau put the netminder out by TKO with the only goal in the second period. Erik Gudbranson’s blast on the power play, which resulted in a shattered stick, was recovered by Drew Shore. The rookie flipped it toward Huberdeau, who tucked the puck near the post past Bryzgalov on his second poke at it. The two goals gave Huberdeau, the only first-year player leading his club in goals, eight tallies on the year to go along with five assists. Brian Boucher replaced Bryzgalov, who again tossed his goalie stick — this time while stomping down the tunnel to the dressing room. Clemmensen, something of a surprise starter in goal for Florida, denied the Flyers (8-10-1) until Luke Schenn scored from the point late in the third period. Jakub Voracek scored his seventh of the season on a wrap-around 62 seconds after Mueller scored following up a miss by Shore off a neat feed from Huberdeau on a play that started with the Florida winger outworking Philadelphia defenseman Nicklas Grossmann for puck possession at center ice. Clemmensen had solid support from his defense, who cleaned up numerous loose pucks in front of the Iowa native. After a 7-1 rout by the Flyers at the BB&T Center on Jan. 26, Florida won the season series with a pair of wins in Philadelphia. The first one was a 3-2 win in a shootout on Feb. 7. In that one, Mueller and Huberdeau again were the culprits, beating Bryzgalov in the first two shootout rounds. It was just the second time in franchise history that Florida had swept the season series in Philadelphia. It was a strong night in the Southeast Division standings for Florida as well. Carolina and Tampa Bay, both with 17 points and atop the division, lost in regulation, while Winnipeg gained two points in the 4-3 win over the Hurricanes. Last-place Washington lost 3-2 to New Jersey in the first of two games in D.C. in 48 hours; the two teams meet again Saturday. The Panthers return to action Friday night in Western Pennsylvania, where goaltender Jacob Markstrom is expected to make his first start of the season against the Pittsburgh Penguins (11-6-0), a 6-5 loser to the Flyers on Wednesday. SUNRISE — Just when the Florida Panthers thought it couldn’t get much worse, it did on Monday night. The Panthers closed a woeful four-game homestand by being blanked by goaltender Ben Scrivens and the Toronto Maple Leafs, losing 3-0 and wasting another opportunity to gain points in the Southeast Division standings. It’s a scene the Panthers (4-7-4) seem to have perfected over the past week, this time in front of 17,177 at the BB&T Center. Florida squandered two-goal leads late in two of its three home overtime losses on the home stretch, dropping games in the extra session to Washington and Tampa Bay. Between those two, the Panthers fell 1-0 to Montreal in overtime. Three points in four games — not exactly what coach Kevin Dineen was searching for before the club leaves for Pennsylvania and games against Philadelphia and Pittsburgh. “Personally, I think our power play sucked the life out of us,” Dineen said. “We didn’t get anything generated, yet we didn’t respond very well to that. That’s an area we have to keep working on and have our special teams give us a boost instead of going 0-fer on the one side and giving up the big goal on the other. Florida had excellent chances in the opening 20 minutes but couldn’t beat Scrivens, who stood strong against Ottawa over the weekend for his first career shutout. The former Cornell University netminder was the real star for Toronto (10-6-0) early, fending off multiple scoring chances by Florida, including rookie Jonathan Huberdeau’s slick feed to Alex Kovalev, who was stuffed 1-on-1 by Scrivens. Phil Kessel, much maligned over his 10-game start without a goal, took a pass from James Van Riemsdyk following Mike Weaver’s turnover just inside the offensive zone. Kessel skated in and beat Florida goaltender Jose Theodore on the short side. Florida put itself in a bigger hole in the second when Nazem Kadri banged in a power-play goal from the slot for the 2-0 lead. Clarke MacArthur scored just over a minute later from a nice pass from Kadri after Brian Campbell crossed over to help out, leaving MacArthur alone for his third goal. Scrivens stopped 37 Florida shots after beating Ottawa with 34 saves in a 3-0 win over the Senators on Saturday night. Florida travels to Philadelphia to face the Flyers on Thursday night. The Panthers won 3-2 in a shootout on Feb. 7 in Philadelphia after Jonathan Huberdeau and Peter Mueller scored in the shootout and goalie Jose Theodore stopped both Flyer attempts. The Panthers then play in western Pennsylvania Friday night against the Pittsburgh Penguins. When considering this four-game home stand — so promising a week ago but now just a reminder of decent play at times that yielded bad results — I think of one word: salvage. Really, that’s all the Panthers have left going for them in this stretch of four home games — two in which they led by two goals, plus one scoreless contest. All ended in overtime losses — three points (the minimum) instead of six (the maximum). A difference of three. Three more in the points column would have put them at 15, solely positioned in second just two points behind Southeast Division leader Carolina. Fifteen points would have also had Florida in the eighth to ninth spots, the important playoff cusp, in the Eastern Conference standings instead of 13th. Under any other circumstance than the one that has occurred this homestand, Florida would gladly accept five points out of a possible eight. If the club tallied points at that pace from opening night, the Panthers would end with 60 and most definitely secure a playoff spot. But while they did start with a win, the Cats have been 3-6-4 since the home win over Carolina and aren’t in a position to let points get away. Sure, all of that falls into the “What If” category, but it illustrates how important these points are, and their value increases doubly when you play just over half a season to figure out who will battle for the Stanley Cup. Right now, Florida should forget about points — strike the word “points” from the vernacular. And don’t anyone say, “Hey, at least we got a point.” Just get a win over Toronto to boost morale, leave South Florida on a good note and try to regain some mojo in the Keystone State. LIMPING LEAFS — Just like every team in this short season, Toronto has been nagged by injuries, and the news didn’t get any better last week. Second-leading goal scorer Matt Frattin (knee) and starting goaltender James Reimer (knee) were both placed on injured reserve and won’t play against Florida. They join defenseman Carl Gunnarson (hip) and forward Joffrey Lupul (forearm), who have played in seven and three games, respectively. Toronto called up goalie Jussi Rynnas to back up new starter Ben Scrivens. Rynnas, a native of Finland, has yet to make a start. TOP SCORERS — James Van Riemsdyk leads Toronto in goals with eight, and all I can say is this: For the sake of the Florida writers’ spelling skills, let’s hope JVR stays off the scoresheet. Despite playing in just 10 games, Frattin still places second with seven, while Tyler Bozak and Nazem Kadri have five and four, respectively. Phil Kessel tops with nine assists and Kadri has eight. Jonathan Huberdeau leads the Panthers with six goals — the only rookie to lead his team — and is second with nine points. LEAFING HOME — The Maple Leafs are off to a solid start and much of the success has to do with the way the club has played away from the Air Canada Centre. Toronto is 6-2 on the road and currently rides sixth in the Eastern Conference standings. The Leafs are 7-3 in their last 10 and 1-0 in overtime. Toronto is one of three NHL teams not to participate in shootout yet, the other team being Carolina and Washington. NUMBERS GAME — Florida RW Alex Kovalev needs one assist to reach 600 for his career. His 599 helpers grid him sixth, and he’s sixth in points with 1,029. Stephen Weiss sits at 249 assists for his career and linemate Tomas Fleischmann has 99 goals. RAKING THE LEAFS — Florida owned Toronto last season, sweeping the four games in the season series — they also did it in 2008-2009 — and outscoring them 20-9. Florida has won the last five in the series and garnered points in 16 of the last 19, going 13-3-3. The Panthers are 24-24-7-5 against the Ontario club. Mon., Feb. 18, 7:30 p.m.
Florida has 12 points in 14 games: 41.1 over 48 games. SUNRISE — Like anyone else, I don’t like being forced to do something. Maybe that extends to being a sportswriter as well. Last night with just over five minutes remaining in regulation, everyone in the BB&T Center press box had the story he or she was going to write — the headline would read “Panthers Start Homestand with Big Win” or “Florida Exacts Revenge on Rival” or something similar. Only one thing changed all of that, though: Six minutes of wretched hockey by the Florida Panthers that forced everyone to write about something else. The Cats (4-6-2) completely gave away a win and an extra point — in a revenge game, no less — against a Washington club that was on life support less than a week ago, losing to the Capitals 6-5 in overtime in front of 15,340 very angry, disappointed fans. Also, Florida failed to gain at least one point on every team in the division except Carolina. The dressing room last night was a wreck. Certainly it was music-free, but it was as silent as the movie The Artist. The stunned expressions on players’ faces said enough. Peter Mueller, who had two assists and continues to impress, seemed the most affected, slumped in his locker and still in uniform while the media went across the room to talk to Jonathan Huberdeau first. There were too many great storylines floating out there last night that were eventually backspaced over and deleted. My Twitter timeline and the political talk shows this morning mentioned missed opportunities at the State of the Union Address by President Obama and in Senator Marco Rubio’s rebuttal, but did anyone have a worse night than the Panthers? Sure, Montreal wasted a late three-goal lead in a nanosecond, but they redeemed themselves in a shootout win over Tampa Bay. Dmitry Kulikov made a regrettable pass that led to Troy Brouwer’s game-winning breakaway 32 seconds into overtime. In the circle? Forget it. Florida got spanked 44-24 in face-offs by a team that hasn’t been good at draws early on. Super swell guy Scott Clemmensen — heck, he’s from the same corn-centric state that produced Radar O’Reilly and Field of Dreams, the best baseball movie ever — was a few notches below mediocre in net. The Iowa native (4.32 GAA) has had three starts in goal and has been unreliable every time, at Montreal and Winnipeg and last night, all ending in losses. His role as the backup for this team has to be questioned with future netminder Jacob Markstrom waiting in San Antonio. On a night when every good bounce for the Cats seemed to end up past Caps goalie Braden Holtby, Florida found a way to blow a statement game at home against a divisional rival. Tomas Fleischmann’s spinning goal in the first period caromed off John Erskine’s right skate and beyond Holtby. Florida’s third marker was a double-deflection — Mueller first in the circle, then Huberdeau for the score. Shore’s goal bounced in off Erskine, whose night as a defenseman was as bad as Keith Ballard’s in Atlanta when he swatted teammate Tomas Vokoun. The first career two-goal game by Huberdeau would have been a fine story. I’m sure the Quebec native and Calder candidate would have donned the red hat he wore on opening night, whose euphoria seems like light years ago in an arena far, far away. Revenge is always a good theme after getting drilled by a team three days earlier, too. And Shore’s elusive first goal, which has tantalized the rookie, would have made for strong copy as well. These Panthers, though, wouldn’t allow those stories to be fleshed out and filed. For one devasting six-minute stretch, these Cats looked like Pete DeBoer’s team from two years ago, a group that specialized in grabbing leads and then blowing them in any manner possible. Turnovers in their own end, sieve-like goaltending, untimely penalties, failure to put the game away with an empty-netter, you name it. Heck, a power-play goal in the last two minutes to win it was potentially there for the taking also, but not on this night. Far too many great storylines existed last night to let the ones that were written actually get written. 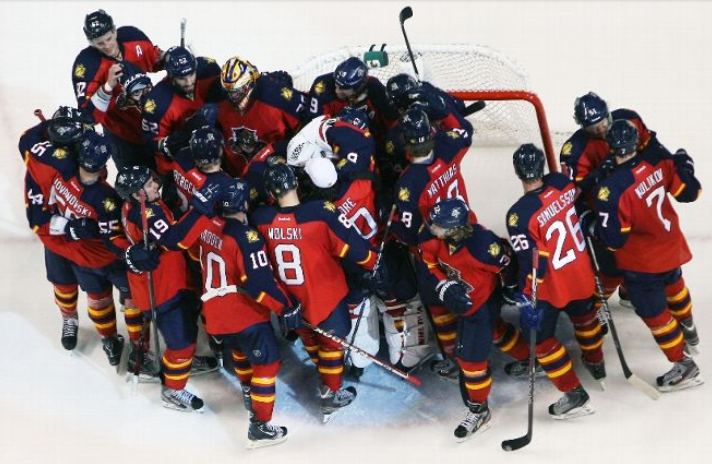 Did the Florida Panthers’ season seem over after that 1-5 start? The joy of opening night’s 5-1 win — from Huberdeau to Upshall to Kovalev to Campbell to Theodore in front of a packed BB&T Center — seemed like a spring memory, a leftover from last year’s season-ending win over the same Carolina Hurricanes that clinched the Southeast Division title. A five-game losing streak will do that to you: Make you move out of the present and into the past. And forget all those shootout losses from last year. These punchless Panthers couldn’t even get to the extra session over five games. Some in the press box even joked that their assignments might shift to other sports if Florida’s play stayed so dreadful. However, the 6-3 home win over Winnipeg was a season-saver. Then the road trip began. A Buffalo team losing on Super Bowl Sunday was not big news, but it was to Florida fans. The last-second loss in Winnipeg was a little discouraging, but the Panthers had points in three consecutive games. The shootout win — make that, the easy shootout win — in Philadelphia was a preview of future sessions, where Jonathan Huberdeau and Peter Mueller can show off their skills. So that was seven points in four games — a striking improvement from what was mostly a bad January. Things didn’t go so well in the nation’s capital. In fact, that poor performance could have been skipped altogether. The club should have just kept coming south from Philly and back to sunny Florida. Really, the only chance Saturday night in Washington was if that brutal storm that postponed Tampa Bay’s game in Boston would also have shut down the Verizon Center. The Jan. 31 home win over Winnipeg may have saved the season, but the four-game road trip put the Panthers (4-6-1) right in the thick of the NHL’s most competitive division — the Southeast, where merely five points separated the suddenly not-so-electric first-place Lightning (6-5-0) and the underachieving, cellar-dwelling Washington Capitals (3-8-1) as of Sunday’s games. If I’m filling out a report card and handing out a grade, I’d have to say that taking the extra point in Winnipeg would have made the road swing worthy of an A. It would have been the stuff Principal’s Lists are made of. Five out of eight possible points on the road trip gets a solid B, though. ONCE BITTEN — There was no hockey fun at all in D.C. on Saturday night, and I missed all of the late drama in the Toronto-Montreal game that was occurring while the Cats were being shellacked. The Leafs pounding the home Habs 6-0 was bad enough, but when Mikhail Grabovski bit Max Pacioretty’s arm, the fierce rivalry was turned up a notch. To no one’s surprise, the lines of demarcation regarding the incident were drawn geographically above the 49th parallel. Most of the comments from Quebec regarded Grabovski as the new Alex Burrows, a villainous Belarusian forward who had disrespected the sport and crossed hockey’s own boundaries. Meanwhile, folks in Ontario offered in English that the Toronto center was just protecting himself. They reasoned that Pacioretty was the aggressor and should have expected any form of retaliation. Advice from someone who’s been in a fight: If you’re in one and going face-to-face with your opponent, don’t stick your hand in his mouth. Worse yet, if you’ve wrapped up your adversary from behind and you continue to be aggressive with him, pulling or twisting the head area, don’t be surprised if he bites you if that’s the only way he can extricate himself from such a tight spot. Grabovski received no supplemental discipline from the league Monday afternoon, nor should he have. He’s not Alex Burrows and his actions won’t likely spawn a slew of copycat biters. But if it does, just describe future bitings as being “Mikhailed” or “Grabovskied,” whichever rolls off the tongue better.